German officials have rejected China's demands for access to sensitive technology in exchange for building a 4.3 billion dollar high-tech rail link between Shanghai and Hangzhou, the Financial Times says. The newspaper said Berlin officials refused to give in to Chinese pressure to sign off on an agreement on the magnetic levitation (Maglev) train prior to German Chancellor Angela Merkel's visit to China last month. Chinese officials approved the building of a new 170-kilometre (105-mile) track in March but discussions with the companies have been going slowly as Beijing is looking for significant technology transfers and funding as the price of admission. At a meeting in Beijing last week, German Transport Minister Wolfgang Tiefensee rejected requests from the head of China's National Maglev Transportation Technology Research Center for German government funding, the newspaper said. It also quoted a Berlin official as dismissing suggestions in the Chinese media last week that the German side had agreed to transfer "core aspects" of the Maglev technology to China to secure the contract. "We want to stick to conditions agreed for the (Shanghai) airport track. Levitation and engine technologies will remain in German hands," one person close to the companies said. Beijing has been in talks for years with Transrapid International, a joint venture between engineering giants Siemens and ThyssenKrupp, over building the world's second commercial high-speed maglev track. Shanghai operates the world's only commercial Maglev system on a 30-kilometre (19-mile) run between Shanghai's financial district and its Pudong airport. 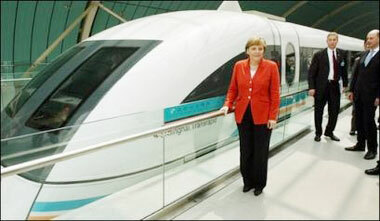 Germany provided 10 percent of the one billion dollar budget for the Shanghai airport link. The newspaper cited a Transrapid International spokesman as saying that talks were ongoing over the second rail line that China is keen to finish ahead of the 2010 World Expo to be held in Shanghai.